Bathroom vanities are the center of every well-designed bathroom. Without one, your bathroom really isn’t much of a bathroom at all. If you’re redesigning your bathroom or considering giving it an aesthetic update, it only makes sense that you would take some time to explore bathroom vanities. Luckily, there are tons of different designs and sizes available. So, you’re bound to find something you like that fits in your space. But, this number of choices can also become overwhelming. After picking out your new bathroom vanity, you might want to check out our list of essential oil diffusers to take the relaxing atmosphere to a whole new level. To help you navigate the giant world of bathroom vanities, we reviewed dozens of products to identify the best of the best. We considered size, aesthetics, materials, durability, ease of installation, customer reviews, and much more when ranking each product. This is the best bathroom vanity money can buy. In the end, the 24-Inch Traditional Bathroom Vanity Set in Dark Coffee Finish easily took the spot as the best bathroom vanity on the market. It isn’t bulky like many other vanities but retains its functionality. Plus, it is also very aesthetically pleasing and fits into a lot of home designs. 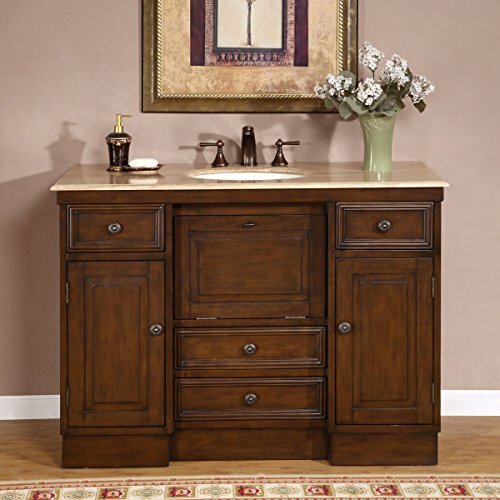 The 24 Inches Traditional Bathroom Vanity Set in Dark Coffee Finish is the perfect choice for nearly every home. It includes a wooden countertop, storage underneath, and a vessel sink. It isn’t enormous like many of our other picks, but it isn’t tiny either. It is designed to fit nicely into most bathrooms. Its dark color allows it to match nicely to almost any décor and can keep it looking cleaner for longer, which lessens the amount of cleaning you have to do. The glossy surface is also designed to be easy to clean, so you can spend less time scrubbing and more time enjoying your day. While this bathroom vanity was designed to be easy to install, some customers reported that it was somewhat harder than they expected. Despite this, many customers did say that they got it together with some effort, but it did take them longer than they were expecting. We recommend giving yourself plenty of time to put this vanity together. You might also want to enlist an extra pair of hands. This vanity weighs just over 200-pounds and would be easier to move if you had someone around to help you. If you’re looking for a modern-looking bathroom vanity, though, this is the way to go. For something a little larger and traditional, this is the bathroom vanity to get. Not everyone wants or needs a modernly designed bathroom vanity. They don’t fit into every space or please everyone’s aesthetic vision. If you’re looking for something on the more traditional side, the Silkroad Exclusive Hyp-0718-T-Uic-48 is the one you need to get. It is somewhat bigger than our top pick but also includes more storage. The walnut finish allows it to fit most bathroom décor and the travertine stone top adds just a touch of elegance to any bathroom space. The stone top is completely natural and the whole thing is crafted out of solid wood. This bathroom vanity is easier to put together than our top pick, but it also weighs a lot more. You will need at least two people to carry this vanity into the position you want it. If you can, we recommend even having a few people close by to help you carry it. This heavyweight also means that it is incredibly durable, however. It is made out of solid wood, which prevents it from chipping or falling apart after extended use. After all, no one wants to re-do their bathroom only to have to re-do it again years later because of a broken vanity. For homeowners on a budget who still want a great bathroom vanity. Perhaps you’re facing an emergency bathroom remodel. Or, maybe you don’t want to spend more money than you have to fix your bathroom up. Whatever the reason, the Design House 545053 is a wonderful budget option that can spruce up your bathroom without taking a lot out of your pocket. It comes in four different off-white finishes and three different sizes. However, not every finish comes in every size, so be sure to figure out what size you need before committing yourself to a color. No matter your bathroom design, this white vanity can quickly match and highlight your other design features. It mixes modern construction with subtle vintage details, giving your bathroom a unique and well-designed feel. It features clean lines and concealed hinges, which make it feel a lot more expensive than what it is. It comes with one door-style cabinet and two drawers. A cam-lock connection system makes the whole thing extremely easy to put together, but very time-consuming. It comes completely unassembled but does come with pre-drilled holes. It also does not come with the top or sink, so that is something you might want to think about when deciding whether to get this budget option or choose a more expensive option like our top pick. While the lack of these critical parts does mean you will have to spend a little bit more money, it also means that you can customize the sink to your space, which is not an option with many of the other vanities. Designed for extremely tight spaces. Some bathrooms are just small. They don’t have much room for standing in, never mind installing a bathroom vanity. These small spaces can make remodeling particularly difficult. It is hard to find a vanity that can fit them and still be functional. Luckily, the Small Bathroom Vanity Cabinet and Sink by Fine Fixtures was designed for this exact purpose. It is incredibly tiny, while still being very functional and aesthetically pleasing. It has enough storage space for the necessities and has a full-sized sink. With a white finish, it can fit nearly every bathroom design easily. But its small size does not mean that it isn’t high-quality. It is made of real wood and comes with two chrome handles – one for the top door and one for the bottom drawer. It comes brand new in a factory sealed box, so you can be sure that it is high-quality and untampered with. While this vanity does not come with a facet, it does include pre-drilled holes to make installing one very easy. If you’re looking to replace an over-sized vanity in your small bathroom or perhaps even add one altogether, this small bathroom vanity will ensure that the space is functional without being too cramped. When you need more than just one sink. A double vanity is a must for master bathrooms. When you both have to get up and go in the morning, no one wants to fight over the sink. A double vanity makes getting ready easy and eliminates the need to decide who will get the bathroom when. If you have a large family, you might even want to install a double vanity in your other bathrooms too. Having two sinks can be life-changing, especially if early-morning arguments over the bathroom are common. 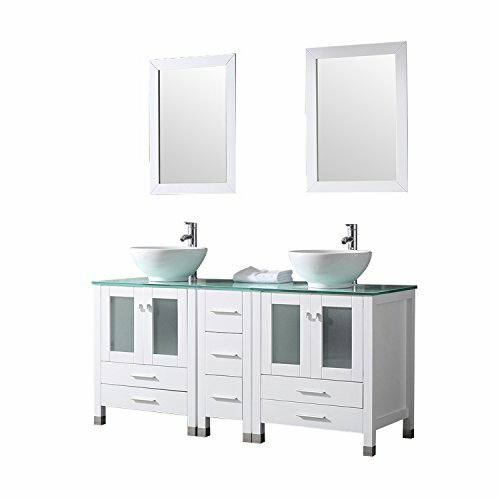 If a double vanity sounds like the right choice for your family, then the BATHJOY 60″ White Double Wood Bathroom Vanity is the way to go. As far as double vanities are concerned, it is decently inexpensive while still being high-quality. It is entirely made out of wood with a ceramic sink. With seven drawers and double cabinets under each sink, it has plenty of storage for two people to keep all their morning essentials stored away. The countertop is large enough for two people to use it at the same time, and the hardware and vessel sinks give it a very modern vibe. To prevent you from waking the whole house up, the doors and drawers are both soft closing and make minimal noise. Unlike many other bathroom vanities, this one does come with the faucets and mirrors pictures. A vanity is necessary for any bathroom. Whether it is a large, master bathroom or a small guest bathroom the size of a closet, a bathroom vanity is a necessity. Without one, you can’t wash your hands, store many of your bathroom necessities, or pretty yourself up in a mirror. If you’re redesigning your bathroom or perhaps even building a whole new one, a bathroom vanity is required for the space to be functional and complete. But not all bathroom vanities are the same. There are single vanities, double vanities, small vanities, large vanities, and everything in between. Taking a good long look at your space and considering how often the vanity will be used is important to choose the right vanity for you and your space. A guest bathroom that is only used once a week is going to need a different vanity than a bathroom that is used multiple times a day. We recommend taking a careful look at our top five list and even some of the other products we reviewed below to find the perfect vanity for your bathroom. Durability. If you’re installing a bathroom vanity, you’re probably expecting it to last at least a decade. However, this is not the case with many bathroom vanities. Some vanities are made with materials that just do not stand the test of time. We recommend choosing a vanity that is made of real wood and always checking the customer reviews. Completeness. Not all bathroom vanities come with everything you need for it to be functional. In many cases, bathroom vanities do not come with mirrors or faucets. Some do not even come with the countertop or hardware for the cabinets or drawers. When evaluating price, it is also essential to assess the completeness of the product. After all, what might look like a good deal might not be so if it comes incredibly incomplete. Size. Some bathrooms aren’t much bigger than a closet, while others are gigantic. We recommend measuring the location you want the vanity to go and selecting a vanity size very carefully. You should not only consider how much wall space you have but also how far the vanity will extend out into the bathroom. Choose a size that will look correctly in the space and provide you with enough storage and sink space. Assembly. Nearly every sink vanity is going to require some amount of assembly. The amount and toughness of this assembly will differ from vanity to vanity. Consider how long a vanity will take to put together and how hard it is to put together correctly before purchasing it. You should also take into account the weight of the vanity. Some smaller vanities will be light enough for one person to assemble, but many larger ones will require at least two people. Planning can make the assembly and installation process go a lot smoother. Design. While it is essential for a bathroom vanity to be functional, how it looks is also important. Most vanities will be at least somewhat aesthetically appealing. But many will be created with a specific style in mind. Matching that style with the style of your bathroom and house is important to ensure that the design concept is fitting. What is a bathroom vanity unit? A bathroom vanity unit is the combination of a bathroom sink and some sort of cabinet for storage. These units have become more and more popular over the last decade or so due to their integrated storage and minimalist design. What are standard bathroom vanity sizes? Bathroom vanities differ a lot in size. Some are shorter while others are taller. Some are wider, while others hardly have room for a sink. There is not really a “standard bathroom vanity size.” Bathroom vanities can be between 12- to 82-inches in width, though typical widths are 24, 30, 36, 48, and 60 inches. Height can be between 31 to 36-inches, though shorter or taller vanities are not uncommon. We recommend carefully measuring where you want the vanity to go. Generally, you should be able to find a vanity with the measurements you are looking for. What is the best height for a bathroom vanity? This depends on who you expect to be using the vanity. For a children’s vanity, a shorter size is usually more appropriate. If you’re choosing a vanity for your own bathroom, we recommend taking your own size into account. If you’re shorter, you might want a shorter vanity. But, if you’re taller, a taller vanity would probably suit you better. If the vanity is for a guest bathroom, we recommend something in the middle. Don’t worry too much about the exact height for your vanity. In the end, you’ll probably find that it does not matter all that much. What is a comfort height vanity? A comfort height vanity is a vanity that is 36” tall – the same height as most kitchen countertops. Many new vanities are being raised to this height, especially in master bathrooms where it is assumed small children will not be using them. However, just a few years ago 32” was the average. We also looked at 20 other vanities for bathrooms. Even though they didn’t make our five best bathroom vanities list, they’re still the best of the rest, and each is still a great option for your dog. The information you’ll need to compare each one is included with the listing. 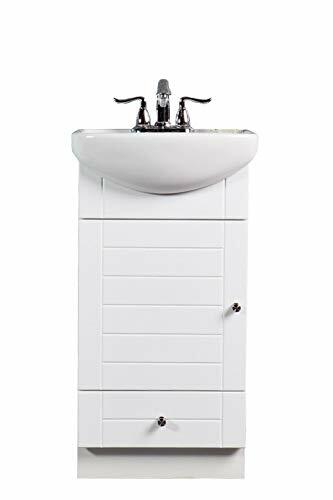 This is a small wall mount cabinet with a white porcelain vanity sink that has a scratch and stain resistant finish. It also includes single hole faucet and drain. This eclife vanity and sink combo has to be assembled, but the simple design makes it easy to install. Another great detail is the 1.5 GPM faucet that will save you water! This bathroom vanity comes with a Knock-down rectangle ceramic sink top that is stain and scratch resistant. The vanity has soft close design doors with a 1.5 GPM faucet. The Renovator’s Supply Small Wall Mount Bathroom Vanity comes with a black vanity cabinet and white vitreous china sink. This soft white vanity with a porcelain sink has two doors, hardwood frame, and scalloped legs. It also has 105-degree hidden hinges and pre-drilled faucet holes. The Homecart 60” Bathroom Vanity Cabinet is a double sink vanity that is durable and will fit perfectly with most décor. This item is also easy to assemble. This vanity cabinet is made by Homecart; it is a durable vanity and easy to install with a 1.5 GPM faucet that prevents water splashing. This high-end vanity set comes with 100% solid wood and plywood only. It does not come with any MDF or cheap particle board. It also comes with authentic Carrara marble countertop imported from Italy that comes pre-installed. This is a traditional vanity with a double sink cabinet and a white oak finish. It comes fully assembled and pre-drilled for 8” widespread faucet. The Vinnova Gela 60 inch Double Vanity is free standing and crafted of laminated solid wood. It also comes with a Carrara White Marble countertop. This wonderful bathroom vanity cabinet has a ceramic top integrated sink plus a faucet and drain. The vanity is finished in dark cherry color while the faucet and hardware are brushed nickel. The Eclife 24 inch Bathroom Vanity comes with a white square ceramic vessel sink, and a chrome faucet finished in solid brass. This vanity also offers an above counter basin without overflow coordinates with most bathroom vanities. This Eclife bathroom vanity is easy to assemble, with long-lasting natural wood. It has a drop-in rectangle ceramic sink top and scratch resistant curving edge. 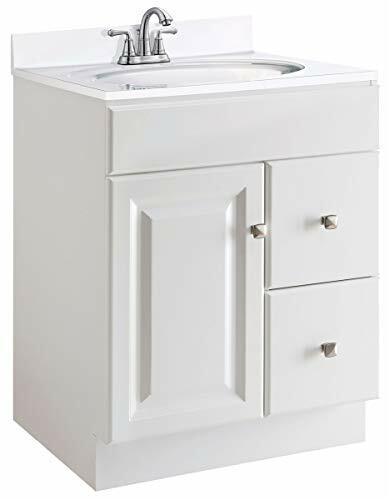 This bathroom vanity comes with three pre-drilled faucet holes, two soft-closing doors, brushed nickel hardware, and a white ceramic top. This bathroom vanity made by Simpli Home is a single sink bathroom vanity with two doors, three side drawers, and one bottom drawer. It has 105 degree hidden hinges and side mounted ball bearing drawer slides. This bathroom vanity made by Elecwish has a wooden countertop and storage that is coated with glossy grid pattern coverage. With this vanity, you do not need to drill more holes and it is easy to assemble. 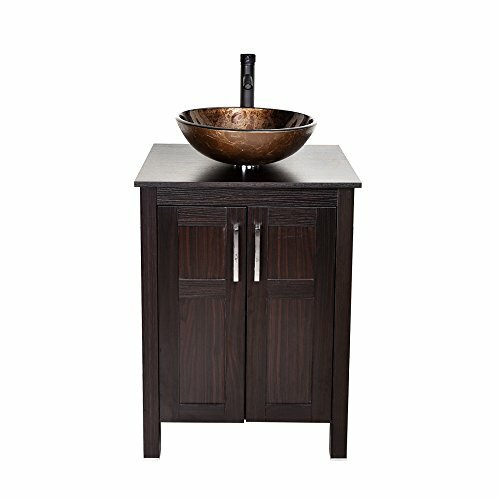 This ELIMAX’S vanity is made of solid wood with white tech stone and vessel sink. The vanity includes brushed nickel or chrome faucet and handles. This bathroom vanity made by ELIMAX’S has a beautiful white tech stone with a frosted glass vessel sink. This vanity also is made of solid wood; comes with the faucet and pop-up drain with mounting ring. The easy to install bathroom vanity and sink combo has a square blue glass vessel sink,1.5 GPM faucet, brass pop-up drain, and mounting ring. This bathroom vanity and sink combo have MDF eco-friendly material used to make the vanity more durable. This vanity is easy to install and is easy to clean. Kristin Hitchcock frequently contributes to Family Living Today. She was raised in Tennessee and still lives there with her husband and toddler. She seeks to help others make informed decisions for their family through her writing by providing clear and concise information on all sorts of topics.